My mother wouldn't allow me to shave my legs (or under my arms or nether region). She said it was because I didn't need to shave since the hair was too fine to be noticeable. I think she was trying to keep me a child a long as possible. So the first thing I did when she dropped me off at college was to buy a razor and shaving cream and go to town on my legs, armpits, and bikini line. I felt so grown-up! A few days later I also felt itchy as the hairs began to grow back. Hello, new pain-in-the-a** grooming ritual! I wondered if my mother was right. Maybe I should have left well enough alone. I mean the hairs on my legs weren't like my aunt's, which were so long and thick that they poked through her pantyhose! Say it with me...ick! I kept shaving anyway because that's what ladies do and I began to look forward to taking long, hot showers and coming out clean and smooth. This is my first summer as a mommy and I've shaved my areas only one time. All you mothers out there know that we have exactly five minutes in the shower. My legs are full of scab-covered nicks from rushing. I can avoid tank tops, but it's too hot to wear long pants. I think I need to rethink the smooth legs aesthetic. Society needs to cut mothers some slack. We have enough on our plates without worrying that you are eyeballing our hairy legs! I TOTALLY agree with you! Shaving is such a pain in the neck. The funny thing is that I did go about 6 months not shaving. I was in my 20's and I lived with a bunch of women so I didn't care. But it sure did get pretty gross. Anyway, thanks for giving me a laugh. I hope you have a great weekend and that you stay "nick" free. LOL. Did you shave while you were pregnant? I always wonder if women who shave religiously find a way to do it while pregnant. 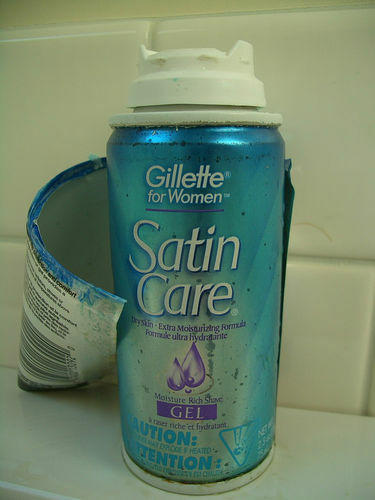 May I suggest using the Schick Intuition razors. They're the ones with the built in shaving cream around the razor which has four blades. 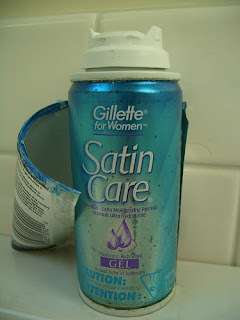 It's much quicker than lathering up, then shaving. Soapbox Saturday: I HATE Baby Commercials! Flashback Friday: I'm Not Your Dorm Room Bunny! Wordless Wednesday: Where is Thumbkin?